Just the thumping of their hearts remained and a question—were they going to lose him? Thanks to the makeover by her sister’s friends, the nerdy Niharika entered college more confident, more attractive. She meets the sweet, shy Tanmay, and the spoilt but lovely Pia and they become best friends. And when Akshat and she began dating, life finally seemed to be falling in place. Except that it wasn’t… Tanmay’s success in football had begun to change him. Akshat’s perfection seemed like a front for something dark and sinister. And their college senior Karthik? His aggressiveness was a cover for his mysterious past. Someone Like You is a powerful and touching story of friendship, love and betrayal. Nikita Singh is the bestselling author of “Love @ Facebook” that released in May 2011. Apart from being a prolific writer, she is also a voracious reader and has a deep interest in literature. She is doing her graduation in pharmacy. She is an expert in World History and has a special command on French Revolution. At twenty, she is one of the youngest and most realistic writers in the country today. “Accidentally In Love” is her second book. Durjoy Datta was born in New Delhi, India, and completed a degree in Engineering and Business Management before embarking on a writing career. His first book—Of Course I Love You!—was published when he was twenty-one years old and was an instant bestseller. His successive novels—Now That You’re Rich!, She Broke Up, I Didn’t!, Ohh Yes, I Am Single!, You Were My Crush!, and If It’s Not Forever—have also found prominence on various bestseller lists. Durjoy lives in New Delhi and loves dogs. Niharika is beautiful with brains. She is friendly, empathetic and compassionate. She is a romantic at heart and eagerly waits to meet that “someone special”! Tanmay is a sweet boy, Niharika’s class-mate and best friend. He is from a small town who is both honest and innocent. He is also a football champ and openly welcomes the changes that big-city-life has in store! Pia is Niharika’s room-mate. She is from a rich family, yet very down-to-earth by nature. She is friendly and understanding. She is also a fitness freak. To begin with, the cover-page is simple and dreamy. The book blurb is neither too promising nor unique. The story, as promised in the book blurb, begins with the makeover of Nikarika; from nerdy to stunning. Then, it is about her journey to new college where she meets new people, the new experiences that follows and the sweet-uncertainties of teenage! The book is divided into chapters and I liked the titles. They are really good! The first 140 pages of the book is all about classes, friendship, love and uncertainties. There is nothing great about it either. They are trivial and routine. However, the book transforms into a good one once it crosses the 140 odd pages. The next 100 pages is an assured page turner which turns you spellbound. As a reader, you realize that the first half of the book was actually weaving the plot for the super-pacey second page! Finally, when you turn the book for one last time, you will have a mixed feeling of both happiness and sadness. What I observed is that the first half is immature and second oozes with maturity. The entire book is from Niharika’s point of view. Niharika – I loved that name and the sound of it. However, there are three chapters dedicated to Pia, Akshat and Karthik. I wish that one was dedicated for Tanmay as well. These chapters help us understand them better. The book is about 250 pages. Therefore, not too long. It can be completed in one sitting. Sadly, the snail-paced first half makes it tough. I might be wrong as well. Because, more than once I thought that teenagers would enjoy this more. One good thing about the book is that it is neat. There is nothing explicit in it. Everything is neatly handled. And it ends with hope. In short, the book will make you smile, turn you nostalgic and make you cry. I will not be surprised if this is made into a movie. As I said, the first half seems to be long, tedious and trivial. The book blurb is confusing. It becomes clear once we have completed reading the book. My dear friend for recommending this book and for gifting the same! 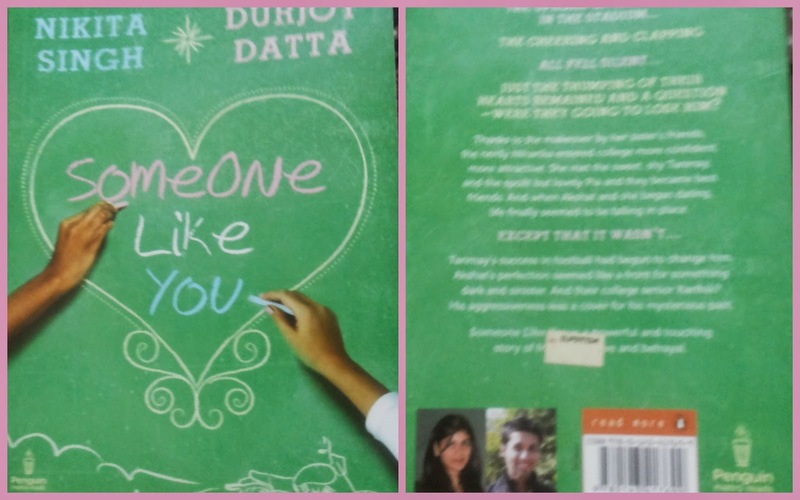 I have only read Durjoy's 1st book .... want to read this one though.